This is a new way to make tiramisu. Now you can have your cake and eat it too… on the go! Incredible flavor in a convenient and beautiful jar. Combine egg whites with cream of tartar and beat in a stand mixer fitted with whisk attachment on medium-high speed for about 4 minutes, or until medium peaks form. Add granulated sugar and beat on high speed for about 1 more minute, or until stiff peaks form. Whisk together egg yolks and Rodelle Vanilla Extract in a bowl until smooth. Transfer the egg white mixture to a large bowl. Pour egg yolk mixture over it and fold in with a rubber spatula. Sift flour over the mixture slowly while folding until incorporated. Transfer mix to the cake pan and bake for about 30 minutes, or until the cake bounces back to the touch when you press on it. Melt the chocolate with 1/2 cup cream in microwave or over a double boiler; cool. Whip cream with the Rodelle Vanilla Bean scrapings. Using a whisk (or stand mixer on med), whip the mascarpone with the sugar and rum until just mixed. Do not over whisk or the cheese will curdle. Fold the whipped cream into the cheese mixture. Chill until ready to assemble. Cut the sponge cake into lady finger size (2 x 1 x 1/2) rectangles. Lay a layer of cake pieces into the bottom of the jar. Spoon the espresso mixture over the cake pieces just enough until almost soaked through. Spread a layer of chocolate ganache over the soaked cake. Pipe the mascarpone 1/2 to 3/4 of an inch thick. Repeat and end with a layer of mascarpone. Dust with a layer of Rodelle Baking Cocoa and/or garnish with chocolate shavings. 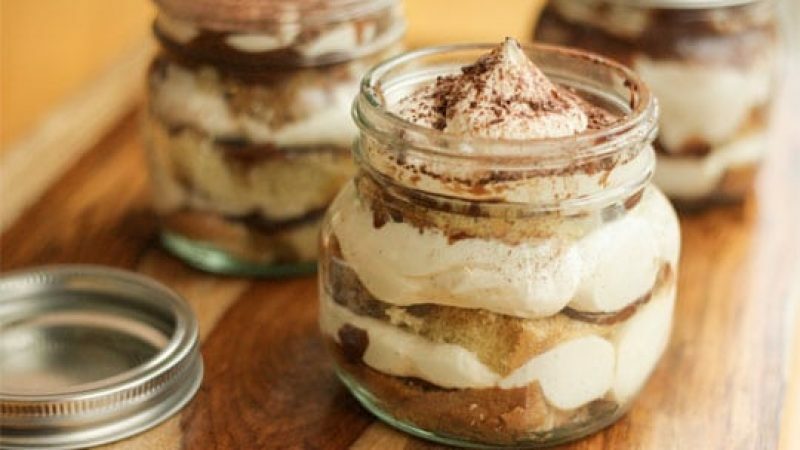 Substitutions: Layer tiramisu components into any glass container, jar, or bowl. Try our Chai Tiramisu to mix things up too!